As a teacher I strive to encourage my students to become more creative in their thinking. It is important that in my class students are taught skills that will travel beyond the doors of the art room. The Geisler Art Room is transitioning into becoming a Choice-Based Art Studio. Which means that the students are guided on their own creative journey. 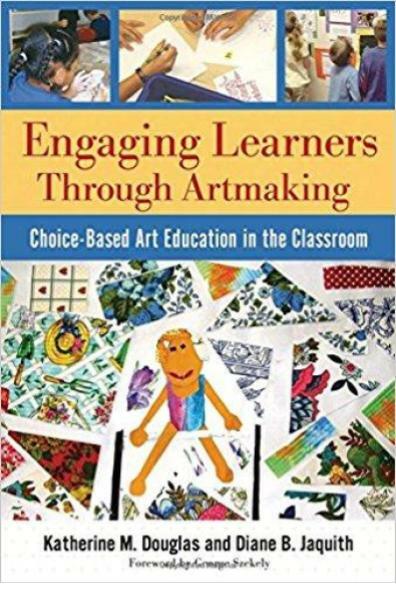 For students this means that the classroom is an art studio where they get to create and make the art that is apart of them. For parents this means that students will be working at their own speed. This does mean that sometimes their grade books may look a bit messy. Feel free to contact me at any time regarding your students grade. Supplies are only a recommendation, many art students like to have their own preferred supplies to work with. Students must have a pencil and a small sketchbook or notebook to pre-plan their work in. This is my favorite sketchpad for middle school. Students will be working on their own art choices in my classroom. Each Link below will take you to that grade level's choice menu with links to resources for that theme. It is currently in the process so more links will be added as we travel through each theme. Most of my art projects are influenced by the books I am reading. Here are a few of the books I am currently enjoying. I love to read and am constantly reading so I will try to keep up with all of the books that I am ingesting here for you. I read in many different ways, some books I get through audible, some through my kindle reader and others in print. If you would like to know more about me check my About Mrs. T page.